The chatty, outgoing Jack (Richard Easton)has a skeleton in the closet. T. Charles Erickson photos for WTF. Jack and Harry (Phillip Goodwin) have a chin wag in the courtyard. 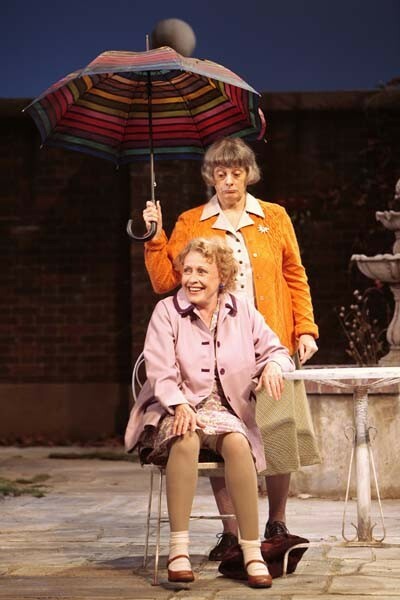 The unhinged Marjorie (Dana Ivey) puts up an umbrella on a sunny day to the amusement of Kathleen (Roberta Maxwell). Directed by Joseph Hardy; Sets, Tobin Ost; Costumes, Alejo Vietti; Lights, Rui Rita; Original Music and Sound, John Gromada; Production Stage Manager, Stephen M. Kaus; Production Manager, Jim D'Asaro; Casting, MelCap Casting. Starring: Phillip Goodman (Harry), Richard Easton (Jack), Dana Ivey (Marjorie), Roberta Maxwell (Kathleen), and C.J. Wilson (Alfred). It is a courtyard on a bright sunny day. To the left is the edge of a large, brick building evoking the late 19th or early 20th century with ersatz Tudor detail. In the foreground is a round, white, metal garden table with two matching chairs. It is set upon a terrace of flat stone masonry. Behind it is a round fountain like formation but without water. At the back of the stage is a brick wall in segments with ornate, ball finials. Clinging to the wall is a spreading vine. To the left and right of the stage are indications of lawn and landscaping. The stage presumably exits into an area of walkways and gardens. The mood evoked by this meticulously detailed set by Joseph Hardy, with evolving lighting tracking the course of a day, by Rui Rita, is one of melancholy, very proper and staid British elegance. 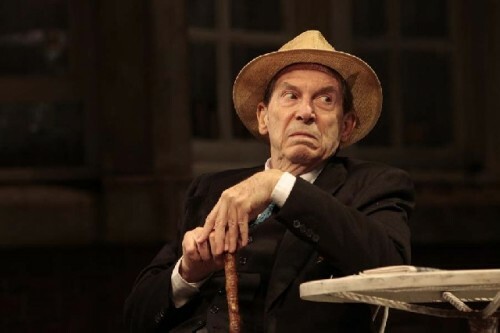 In all of its charm and crisp, realistic detail it is also generic enough that we may anticipate just about anything in the 1970 play "Home" by the former professional rugby player, David Storey (Born, July 13, 1933). The British playwright was a part of the generation which was influenced by and followed the Angry Young Men. His best known work "This Sporting Life" (play, 1960, film, 1963) may be compared to the snarling angst of John Osborne's, 1956, "Look Back in Anger." 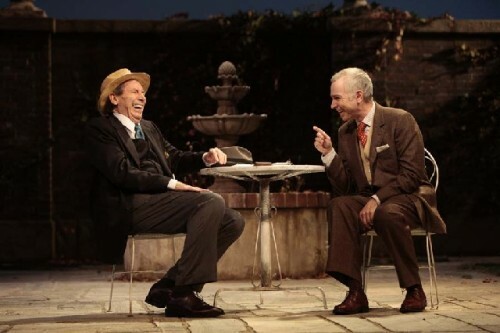 Two neatly dressed (costumes by Alejo Vietti), middle aged gentlemen, Harry (Philip Goodwin) and Jack (Richard Easton) settle into the garden chairs and proceed with a long, dense and nonsensical conversation. It is fast paced, detailed and politely generic in a pattering manner that is uniquely British. Across the pond, with the gift of gab, the Brits speak so well about nothing at all. It must be that superior education. The aggressor is Jack who sets the topics and pace of the discourse to which Harry responds with defensive apathy. The ground covered includes news of the day, memories of service during the War, job descriptions, and marital status. The prattle flits and flickers about with no deep probing into anything overly personal. Harry is separated and lonely while, in a fleeting revelation during the second act, Jack has a thing about boys. In cathartic moments both men weep into their hankies. We gradually learn that they skate on thin ice. The dialogue is so dodgy, dotty and dowdy that it too vividly calls to mind the currently running "Waiting for Godot" at the Berkshire Theatre Festival and the similar, time passing nonentities between Didi and Gogo. This is, apparently, not a wild assumption as Storey was, indeed, influenced by the absurdist theatre of Samuel Beckett. 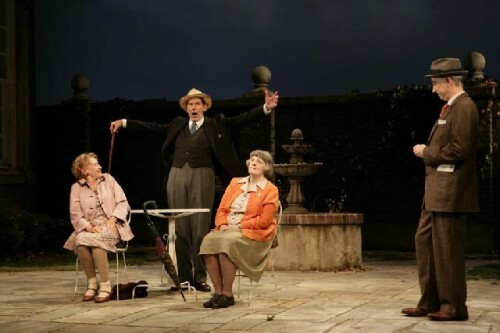 The difficulty and ultimate failure of this perfectly executed production is that, as a playwright, Storey is less than angry and not quite absurd. He has conflated these extremes into a kind of agonizing realism. Instead of sensing that their rambling and diverting discourse is a metaphor, as in Beckett, or the social commentary of an Osborne, we are left with apparently bonkers, well mannered, inanely articulate, but terribly ordinary pensioners having a chin wag about nothing of consequence. While the acting, direction by Joseph Hardy, and production values are top notch, all to the highest professional standards of the superb Williamstown Theatre Festival, it is difficult to respond to, or really care about, this play which now seems enervatingly dated. This may have resonated with an audience in 1970, seeing their own ennui, and the repressed desperation of a declining British Empire a generation after the War, but, today, the comic/ tragedy is a non sequitur. 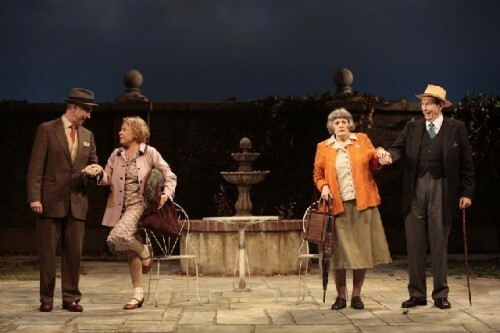 When the men decide to take a brisk walk to build up an appetite before lunch is served, apparently in that building, they are replaced by two older women; the prim and proper Marjorie (Dana Ivey) and her nymphy, randy friend Kathleen (Roberta Maxwell). Their banter is a bit sharper as the women appear to go at it. Marjorie does not approve of her friend. When she points out that a man in the distance is staring at them in an enticing manner the response of Kathleen is to flip up her skirt, spread her knees, and offer a glimpse of knickers. Marjorie is appalled by this. The women are also more revealing of the very British issue of class and social status. They apparently lack grace and style, particularly the uncouth Kathleen. While the men, with their polite and well vetted behavior were harder to pin down. Gradually, we come to learn that all of them are on the cusp between the working and lower middle class. God Save the Queen, and hip, hip, hooray seems to be their mantra. They are the somewhat unhinged, carry on old chap, survivors of all of the miseries of the Blitz. Not really suffering from the nation's post traumatic stress and combat fatigue but not quite right either. Without the implications of the poetic they are a kind of lost generation (lower case). This may have been heady stuff when "Home" was first staged, some 38 years ago. The play was an attempt to put a theatrical finger on the pulse of the national character and its malaise. Today, however, the drama is a thin broth lacking meat and potatoes. It is the entrance of Alfred (C.J. Wilson), a dim witted, working class, strong young man that tips the balance of what we have gradually come to assume. There is an odd behavior as he hoists the chairs with grimace, effort, and triumph as if he were a competing weight lifter. He then carries a chair off stage into the garden. This sets up a bit of musical chairs when the men and women pair off and then reassemble. The men have each brought a chair from the building but they are now one short. There is a bit of comic musical chairs and an argument when Alfred returns. His response is "Do you want to fight?" While Jack will have none of it Marjorie calls his bluff. He proves to be the cowardly Lion of the Wizard of Oz. By the second act we are now aware that the characters are all quite mad. But to us they mostly appear to be just, well, British. Which is to say, mad enough by American standards. There is that usual conundrum of British humor which too often falls flat with an American audience. So this is a play that doesn't travel well through time and space. It is significant to note that WTF has given us the best possible production of Storey's "Home." The actors superbly convey the notion that the characters are not at home but rather reside in a homey asylum. So this is the meaning of "Home." What they are doing there, and why we should identify with them, never quite makes sense. They are just passing time and marking the day with the events of meals and tea time. The characters are filling the time in between with idle chit chat. Apparently, these lost souls, the casualties of War, and the collapse of the British Empire (the elephant in the room), are not waiting for Godot. Pity, at least it would have given them something to look forward to. All that superb effort amounts to rather small beer.